Awhile back I wrote about my Cracked Tooth and subsequent visits to the dentist. The condition of my teeth has deteriorated since those visits, but I have largely been ignoring the pain when I eat ice cream and the twinges when I bite something with resistance. I just quit eating the painful food or switch chewing to the other side of my mouth. I started noticing some receding gum on my top front tooth about a year ago and just hoped it would not move any further. I have heard from friends about grafting gum tissue from the roof of your mouth to rebuild the gum tissue on your teeth, and I am not interested. I can barely make it to my regular teeth cleanings. This morning was my long awaited semi-annual teeth cleaning (already re-scheduled once). We started out with a full x-ray of my head then moved on to 30 minutes of scraping, ultrasonic scaler, baking soda blast, and gum check. Finally, the dentist arrived to survey my throbbing mouth. Let’s start with the good news. No visible tumors or cysts in your x-ray. The gum tissue on your #9 tooth has receded 3 mm. This is almost always a direct result of clenching and grinding. Imagine pushing on a fence post all the time. The dirt at the bottom of the fence post eventually loosens. That is what is happening to your top teeth because you are grinding your bottom teeth against the top ones while you sleep. We need to deprogram your mouth and get it to relax using an appliance at night. It’s like physical therapy for your mouth. Once we get your jaw to relax, we can “reshape” (i.e. sand, drill) some of your teeth to make sure your bite is even (insert heavy breathing from TheRoomMom here). If we don’t start some type of intervention, your top teeth will start falling out in about 10 years (insert more heavy breathing and slight tearing from TheRoomMom here). Dental insurance won’t cover much of the cost (insert visible crying here). Do I need to be seeing a therapist to reduce my stress levels? When you say mouth appliance, are we talking that antenna headgear thing I had to wear when I had braces? 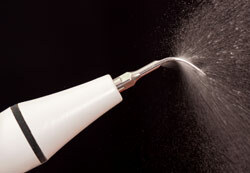 If I agree to all of this mouth therapy, can I avoid gum surgery and tooth loss? Apparently, Occlusal (Bite) Disease is fairly common and is often hereditary (oh good, I can blame my parents). The splint I will need to reduce the teeth grinding takes up about the same amount of space as a retainer so that alleviated a little of my worry. If I get my mouth to relax, my receding gums should stabilize and may even drop back down a little, although, not to their original position. The good news is I would not have my teeth fall out in the near future. I also stopped in the Barre Evolution studio on the way home to sign up for classes to hopefully relax my muscles a little. Gaining weight, flabby arms, lack of muscle tone have not motivated me to get into any kind of regular exercise program. The threat of losing my teeth absolutely spurred me into action. Anything traumatic happening at your house? Are your teeth the source of the trauma? 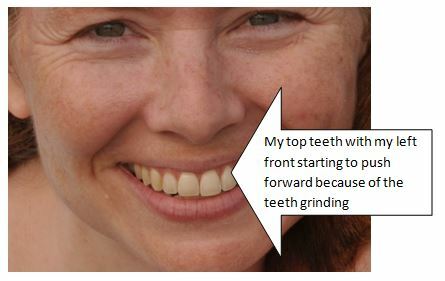 I’ve been grinding my teeth for 30 years (result of stress caused by parental divorce–yes, let’s blame those parents). 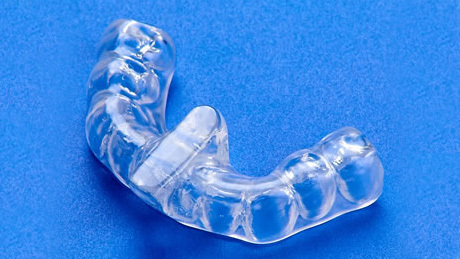 I wear a mouth guard at night and even with that in my teeth are sore in the morning. I don’t feel stress, yet old habits are tough to break. Good luck with your procedures. And the Barre Studio is great! I have their DVD. Thanks! I am hoping the mouth guard will stop the teeth and gum erosion. I hate getting older. I could have loaned you my night guard for teeth grinding! I guess it really does run in the family, although the side effects of my grinding were TMJ, not gum erosion. But wondering if you’ve ever sought a second opinion? Dr. Teeth seems to be setting himself up for large dental bills for many years to come, and scaring the pants off you in the process. I might be skeptical. But hey, if it gets you to the gym, maybe it’s not all bad?? I am definitely getting the “appliance” because I have worn the porcelain off of one crown, cracked a tooth, and have this front tooth with the bad gum. After that, I’ll go for a second opinion before doing anything else. Dr. Teeth says that this night guard might be all I need to fix a few of the problems. I still have the bite pain (among other things) in my back teeth.